Bedroom furniture needs to be chosen carefully as this is the most important piece of furniture for any home. The placement of bed in a room can ruin your entire aesthetics of the bedroom. Ideally, if space permits, it should be placed at the center of the room and all other pieces of furniture should compliment its position. In less than ideal situation that normal city apartment presents, the bed can be pushed to the side of a wall away from direct sunlight. Shunde, China is home to thousands of factories producing all types of furniture so finding a bed to suit your taste and budget should not be a problem. The Louvre Shopping Mall and The Foshan Furniture Expo have many famous retailers selling all kinds of bedroom furniture. Let's examine types of bed available in Shunde, China. Platform bed: are the most practical solution for a small city apartment. They have raised floor and do not require a box spring. Some platform beds come with options of drawers which can be used for storage of bed linen. A headboard is also an option for platform bed which allow you to do some night time reading while resting your back against it. These beds are cheap and easy to assemble. They are generally flat packed so it saves you a lot while shipping to your country. Most modern designers have made a few platform beds. These beds are great for kids bedroom or a guest bedroom. Poster bed: Classic four poster beds are timeless fashion statement. They have been around for centuries. They have four column and an optional canopy or a fabric panel. In Shunde, it is possible to buy an antique 16th century replica of four poster bed made with rich oak or mahogany wood. There are also metal four poster beds available to suit your taste. Whether classic, wooden four poster bed or a minimalist metal variety, it will surely be center of attraction for any bedroom. 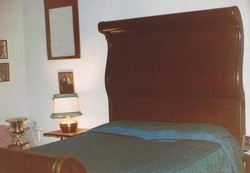 Sleigh bed: These beds have curved or scrolled headboard and footboard. They are often made of wood but in recent time there has been an interest in making it with smooth metal. 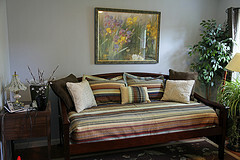 Sleigh bed are great alternative to platform bed however most sleigh bed would require a boxspring. People love these beds because of its clean and elegant style rendering a relaxed, casual look to the bedroom. Day bed: They are cross between a lounge and a bed. It can be used for lounging, resting in common room and they are usually available in twin size. They are great for a family which needs a relaxed living room that can accommodate the need for afternoon siesta. Modern day beds are made with rectangular metal frame with cross support often with provision for storage at the bottom. Some day beds offer trundle in place of storage. This is a great feature if you have occasional overnight guests. 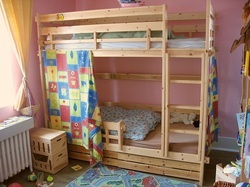 Bunk bed: A bunk bed is the most common type of bed purchased by families with children. Its basically two twin beds put on top of another and joined by a singular frame often featuring an attached ladder to get access to top bed. They are of two most common styles 1. Standard twins and 2. Twin over full where lower bed is full size while the upper on is standard twin. They are useful for any situation where space is tight. Most school campus, youth hostels and army also purchase bunk beds.